FASTTRAK has been the trusted name in ground travel applications for almost two decades with affordable mobile web applications and back-office tools supporting your success. Whether a small business taking a few orders or several hundred jobs per day, our cloud service is the right choice. Our Integrated customer booking and driver apps communicate seamlessly with one another providing a "where's my car and who's my driver" real-time experience while also keeping your cloud back-office system up-to-date on each orders progress. Standing apart from our competition, we serve operations from small mid-sized to well over 200 vehicle fleets using Windows (database in the cloud), Browser based applications and Mobile apps for cloud access to your private database storage. Whether in the office or on-the-go and a new potential customer browsing your site, a registered customer with a login or corporate booking contacts that can manage multiple corporate travelers with one login, we keep them connected to their account data, and help them manage their bookings and complete customer account management. GNET is a B2B open market platform for ground transportation companies to send and receive reservations to each other, with electronic booking, status updates, GPS Location and members are visible to supply side Travel Portals. Put your companies technology on par with the competitive TNC's in your Market. Windows & browser-based products feature a rich user interface in-office and mobile access on the go. We selected Microsoft's Azure cloud global server network to provide private and redundant data storage. Encrypted access and 256 bit military grade encryption of data stored on triple redundant cloud servers. Daily user backups, user backup snapshots on 15 minute increments and nightly off-site backups. 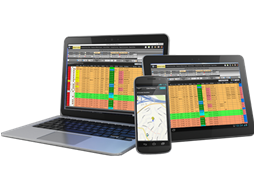 FASTTRAK is a leading supplier of booking, dispatch & billing applications for the scheduled ground travel space providing a powerful foundation for growth. Ultimate: An enterprise class Windows cloud application featuring a broad array of popular and essential features. Express: A lighter mobile web application for small & mid-sized companies that provides out of office mobility. Website tools for registered site users, price quotations, and bookings for browsing site visitors. Hosted service applications allowing integrated & authenticated remote bookings from various sources. A perfect blend of our cloud services, integrated corporate systems and 3rd party distributed system applications providing a bi-directional conduit for remote orders to provide an avenue for growth and global networking. Our Cloud affiliate-to-affiliate order distribution with bi-directional updates of job progress. Affiliate-Connect™, by Deem provides bi-directional bookings between subscribers irrespective of platform. Deem and Groundspan provide 3rd Party integrated bi-directional GDS corporate bookings to subscribers. An integrated network of software providers that provides connectivity and car visibility for customers & driver apps. A combination of our included client & driver web-applications and add-on passenger & driver mobile apps providing mobility, access and service to your clients. Select our included driver web application with status updates or the 3rd party add-on driver mobile apps. Select our included client web application with account management or the 3rd party add-on client mobile apps. Our browser-based mobile web application designed for staff mobility and access when out of their office. Our web application providing integrated customer and new client bookings through widgets installed on your site. Designed for maximum flexibility FASTTRAK's Cloud Technology uses a combination of Web Applications, Custom Mobile Apps, and Windows Applications, all using and interacting with the same Cloud data storage. Our mobile apps allow your clients know exactly who is arriving at their door to transport them to their destination. One of the features of our mobile apps is the comfort a passenger gets from knowing exactly where their vehicle and driver location. The robust architecture for reservation, dispatch, accounting, mobile functionality and diverse array of features allow you to concentrate your time where it matters most; on your Clients, not your software. An overview of the product offerings from FASTTRAK Technologies, available Free Trial-Demo (no credit needed) or purchase from this site. A feature rich Windows interface for connecting your office staff, clients and drivers to your business information with mobility via the Windows Surface Pro3 & 4 tablet or use the Cloud Starter on any browser accessing the same data. An ideal solution for the growing company needing enhanced Enterprise level features add-ons usually only found in enterprise back-office software products allowing you to grow your business to that level. A full featured Windows application, providing mobility using Surface Pro3 & 4 tablets and our Web Express for full mobility using all smart phones, tablets, computers including both IOS and Android devices. Enterprise add-on options make this product the one with which to grow your company. Ask us if your current Hosted or Remote Desktop Application qualifies for our Instant Move-Over Promotional Discount when considering our Cloud Platform! Sign up to receive Blog information about products & services, upcoming events and trade show specials! We always like to here from you! Give us a call or email us any time and we will respond shortly.